Reformation is not a sustainable company. Not quite yet. Instead, they are a company taking you on a journey. The goal is to expand every consumer’s knowledge about the impact of their wardrobes. However, just because they are not operating 100 percent sustainably, does not mean their eco credentials don’t stack up. Learn more about the company with our Reformation Review. I am slightly obsessed with textiles. So, my favorite aspect of Reformation is that they source about 40 percent of their fabric from deadstock. 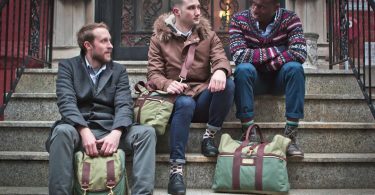 This may be the best kind of upcycling; A LOT of deadstock ends up in landfills, making it accountable for part of the six percent of landfill waste that is generated by textiles. The line is designed, developed, and produced in their LA Headquarters. 80 percent of their supplies and raw materials are sourced locally. They turned the alley behind the office into a “beautiful, relaxing garden for our team to enjoy the outdoors, plant some veggies, and gather for meetings and parties”. As a result, 80,000 gallons of greywater is recycled through it every year. They are a registered BCorps. There are extensive supplier screening systems in place, and these systems are rigorously implemented. …Is whimsical, functional, and modern while still nodding at its vintage sources. Sweeping hemlines and off-the-shoulder silhouettes are adorned by floral prints and dappled eyelets. The style is sunny and easy and gives the impression of a woman who is in control of her life. Even though secretly she’s dreaming of childhood summers spent languidly lounging, idly fashioning flower chains. It’s modern nostalgia summed up in jumpsuits and blouses. Reformation’s Tagline: Being naked is the #1 most sustainable option. We’re #2. An extensive range is currently available, combined from individually released capsule collections. Pieces are available only until they’re not. Sorry. I feel like you may have missed the part where I mentioned extensive range. Reformation, in addition to their daily wear and a full spectrum of accessories, has a complete line of wedding and bridesmaid dresses. It’s that kind of extensive. In an extra bold move, Reformation offers a couple of very cool features. First, every piece contains a care label that goes above and beyond to help you make responsible choices for the life of the garment. Additionally, every product page on the website gives you the mathematical breakdown of your purchase. 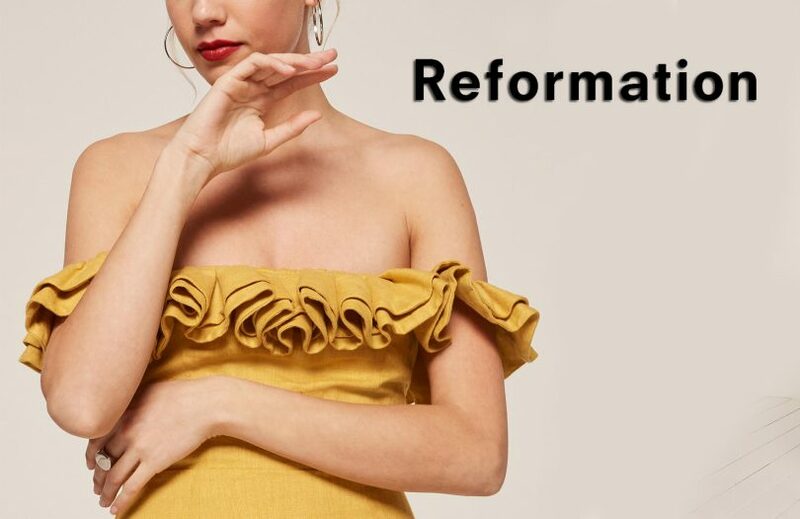 By comparing the footprint of their own work against standards across the fashion industry, Reformation provides shoppers with a snapshot illustrating exactly how this purchase is better than any other big-box brand. 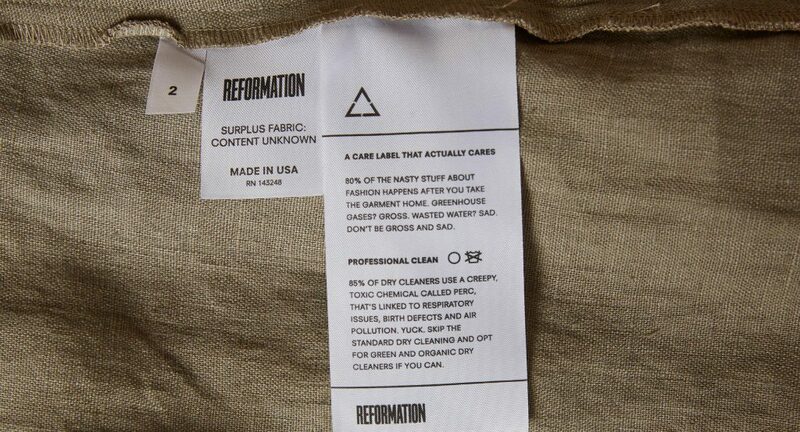 A label that doesn’t only care about the garment but cares about the planet as well. As always, this is no excuse to go out on a shopping spree, instantly undoing so much hard work. But it is an appropriate place to pick up a few basics, and some great accent pieces, the next time those threads are a bit bare. Because with every purchase, they’ll do better so you’ll get better.